If you know where to look, you can find this anywhere in the world, a down east harbor masters office, a ski shack at the base of the Matterhorn, or at a power plant water discharge channel in New Port Richey, Florida; in the early hours of the day old men tend to congregate as if drawn in by a magnet. They will always welcome the younger generation, they always have great stories to tell you and if you listen you will learn a lot about where you are standing this morning. I have always searched out these special places, drank endless cups of coffee, and even a little bit of grappa with these old guys while learning the local secrets from the grand masters. My latest discovery was only yesterday, and this incredible group of retired guys are really good fishermen. They should be, they fish every day (except Saturdays, too many tourist and knuckleheads’). 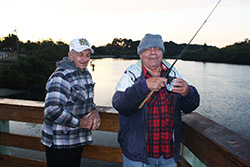 Bill and Frank are known as the ‘live bait guys’ they prefer shrimp and don’t care if they are big or small, they stand about 15 feet apart from each other every day (except Saturdays) since Bill retired 8 years ago. 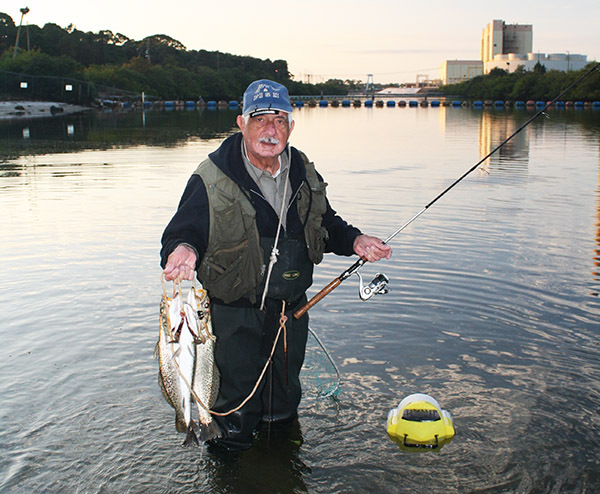 Frank’s been at his spot a bit longer, he retired in 1996 and has fished every day (except Saturdays) since he printed his last magazine. Frank Dinovo retired from printing magazines out of Albany New York; he was in New Port Richey fishing the very next day. In groups of retired gatherings there will always be a mayor, a guy who overseas everything, the power plant mayor is George Bachrakis. He is also from up state New York and a retired charter boat captain, George has fished the power plant every day (except Saturdays) for the past 14 years. George uses what ever they are biting on, knows if anyone has kept over their limit, and just crushes the trout. The New Port Richey power plant has a discharge channel that releases warm water into the Gulf of Mexico. Yesterday on my first trip, the water temperature in the Gulf was 58 degrees, and I could tell from the hole in my waders that the water in the channel was a lot warmer. 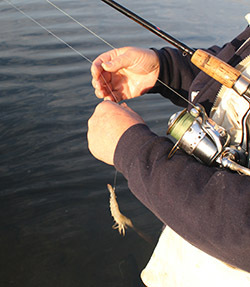 I waded out next to George and on my third cast had my new 7 dollar savage shrimp get bitten off. Bummed out I waded towards shore; George looked at me and said ‘bluefish’. I traded out the Shimano for my Canon and visited with the guys. Richard the DOA guy was sitting watching the live bait guys catch fish. Richard has two colors gold and green DOA 1/2oz shrimp, I showed him the new Savage, but on learning they were 7 bucks a pop he lost interest. Richard told me when the bite is on he has many times out fished the live bait guys on DOA’s. This Morning wasn’t one of them, the water was still on the cold side and the fish were sluggish, I learned where to get the best bargain in the area on DOA’s. He also told me about the drop off, where the trout hole is, and to use 20-pound fluorocarbon leader instead of the 10-pound test I had on. At his advice I re-rigged and borrowed back from Mark, a buddy who I gave a Savage to a couple days before, and took over the spot where Frank and Bill had just limited out on some really nice trout. This one lasted maybe a dozen casts before following the fate of the first one, I was not meant to catch a fish on one of those new lures this day. George knew I lost 14 dollars worth of lures and reminded me I owed Mark a bait, he then told me how I should rig them on shy wire if the blue fish and mackerel liked them so much, he said that the wire wouldn’t bother the trout so much if it was shy, I later heard the same thing from Mark when I replaced his lure at my store. 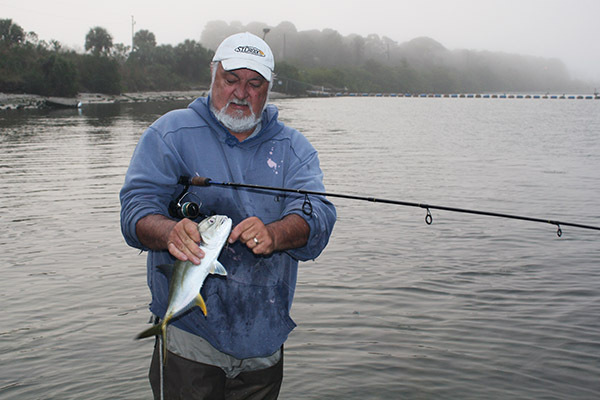 The power plant holds a large range of inshore game fish; Mark Bochenski is a pompano fisherman who prefers using a jig and fly combination. 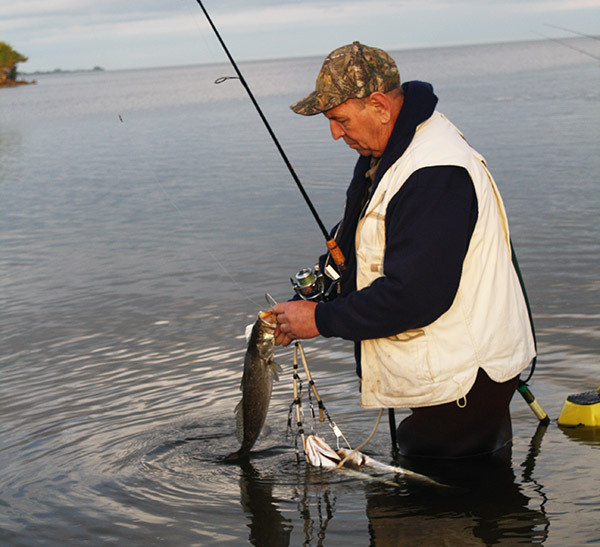 He has caught flounder, redfish, snook, tarpon, trout, and countless pompano on his jigs. Mark rigs up a 7 foot medium action Penn Battle with 10 lb test power pro, a 20 lb test fluorocarbon leader tied direct to the power pro and a loop knot leaving the fly and jig separate on the same knot. A faster retrieve for the Pompano, short brisk jigging on the retrieve and he eats Pompano just about every night. Today as I write this I’m thinking ahead to my morning projects, one more cup of coffee and I go find the leak in my Gore-Tex waders, duck hunting was hard on them this winter. 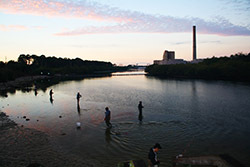 I gotta find my shyest wire material in the fishing room, and make a photo disk up for the guys. I’ll be down at the power plant tomorrow morning with another supply of those Savage Shrimp to try with a copy of this story to hand over to George, because I’m sure as hell not printing anything about these guys till I get the mayor’s approval……. Capt. 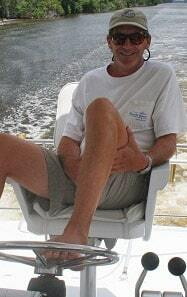 Mark S. “Corky” Decker is an IGFA-certified captain, freelance writer and a proven world-class billfish guide. He grew up commercial fishing on the East Coast, prior to quitting college and relocating to Alaska to cash in on the booming fisheries of the 1980s. After almost 20 years of incredible success, it all suddenly came crashing down with a looming federal lawsuit for illegal fishing practices that changed a whole way of life — not just for him but for commercial fishermen in general. At age 40 Corky ran away to the South Pacific to start over, fishing for marlin and writing about the sport. Today, Corky's home port is Destin, Florida, where he lives with his New Zealand-born wife, Maggie. Corky recently completed his first novel To See A Green Flash and is currently working on a sequel to his personal memoir A Hardway to Make an Easy Living. In the Spring of 2012 Corky came full circle yet again and purchased a Maine harpoon boat to pursue the fish of his youth — giant bluefin tuna. 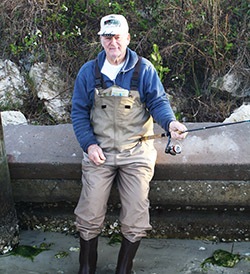 He fishes out of Perkins Cove in Ogunquit, Maine, during the summer — where his passion for fishing began. ﻿To find out more about Corky and order one of his books, visit corkydecker.com.